YES, IT'S REAL. THAT'S WHAT WE CALL COMMITMENT. WE WILL UPHOLD THE HIGH STANDARDS OF THE CRAFT BEER INDUSTRY. WE WILL BE FAIR AND HONEST IN OUR BUSINESS DEALINGS AND PERSONAL CONDUCT. WE WILL COLLABORATE WITH TRUST AND RESPECT AND CONSTANTLY STRIVE TO IMPROVE OUR COMPANY AND PERSONAL PERFORMANCES. WE WILL ALWAYS BE CORDIAL AND MODEST AND MOST IMPORTANTLY, RESPECT THE RIGHTS AND NEEDS OF ALL. WE WILL ABIDE BY THE LAWS OF NATURE AND ADJUST TO THE EVER-CHANGING CONDITIONS AROUND US. WE WILL BE GRATEFUL FOR THE BLESSINGS AND KINDNESS IN OUR LIVES AND STRIVE TO GIVE OUR OWN BLESSINGS AND KINDNESS. OUR TASTING ROOM. OUR COMMUNITY. AT THREE WEAVERS, WE BELIEVE IN OUR MISSION TO BUILD COMMUNITY. "IT'S MORE THAN BEER, IT'S COMMUNITY" IS MORE THAN JUST A PHRASE – IT IS OUR GOAL. WHICH IS WHY WE STRIVE TO BUILD AND PROMOTE A POSITIVE COMMUNITY THAT IS SUPPORTIVE OF THE CRAFT BEER INDUSTRY, OUR HOME (INGLEWOOD, CA), OUR CUSTOMERS, OUR LOCAL SCHOOLS AND OUR LOCAL ARTISTS. AS THE FIRST CRAFT BEER BREWERY IN INGLEWOOD, CA, WE ARE A PROUD MEMBER OF THE INGLEWOOD CHAMBER OF COMMERCE. WE JOINED TO SUPPORT OUR LOCAL COMMUNITY AND PARTICIPATE IN THE FUTURE DEVELOPMENT OF INGLEWOOD. WITH THE ARRIVAL OF THE LOS ANGELES RAMS AND THE NEW STADIUM, WE HOPE TO PAVE THE WAY FOR MORE GREAT COMPANIES AND MORE CRAFT BREWERIES TO CALL INGLEWOOD HOME. 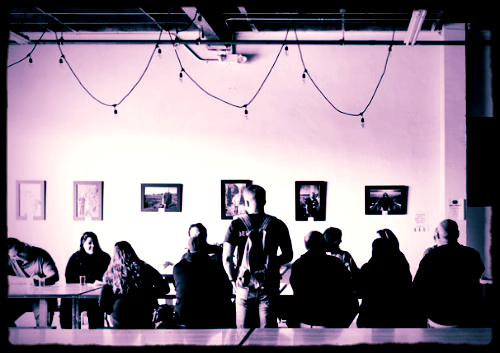 THE THREE WEAVERS TASTING ROOM IS THE HEART AND SOUL OF OUR BREWERY. IT IS THE PLACE TO COME TOGETHER WITH FRIENDS AND FAMILY AND TRULY BE PART OF OUR COMMUNITY. NONPROFIT ORGANIZATIONS AND CHARITABLE EVENTS. TO BE ELIGIBLE, THE NONPROFIT MUST BE A 501(c)(3) ORGANIZATION. SO MANY AMAZING ARTISTS. SO FEW WALLS.